Olivine (also called chrysolite) is a name used for a series of minerals that are among the most common on Earth. The gem-quality variety is known as peridot. These minerals have also been identified in meteorites and on the Moon, Mars, and the comet Wild 2. Chemically, members of this series are composed of magnesium iron silicate ((Mg,Fe)2SiO4). The ratio of magnesium to iron varies between the two endmembers of the series: Forsterite (Fo) (magnesium silicate) and fayalite (Fa) (iron silicate). Members of this series usually range in color from a nearly emerald green to a pale yellowish green. They have a vitreous (glassy) luster and vary from transparent to translucent. In addition, some specimens are nearly colorless and are likely to approach forsterite in composition; others are greenish brown to black and approach pure fayalite in composition. While peridot is used for gemstones, other olivines are used for foundry sand, abrasives, refractories, heat storage, soil conditioning, and slag conditioning. The term olivine is also applied to a group of minerals with related crystalline structures. They include tephroite (manganese silicate, Mn2SiO4), monticellite (calcium magnesium silicate, CaMgSiO4), and kirschsteinite (calcium iron silicate, CaFeSiO4). Olivine was named for the olive-green color of many of the specimens. The word peridot comes from the French word for olivine, and chrysolite, from the Greek words for gold and stone. Peridotite xenoliths in basalt—olivines are light green crystals. Location: San Carlos Indian Reservation, Gila County, Arizona. Olivine occurs in both mafic and ultramafic igneous rocks and as a primary mineral in certain metamorphic rocks. Magnesium-rich olivine crystallizes from magma that is rich in magnesium and low in silica. That magma also crystallizes to mafic rocks such as gabbro and basalt. Ultramafic rocks such as peridotite and dunite can be residues left after extraction of magmas, and typically they are more enriched in olivine after extraction of partial melts. Olivine, or high-pressure structural variants, constitute over 50 percent of the Earth's upper mantle, making it one of the Earth's most common minerals by volume. The metamorphism of impure dolomite or other sedimentary rocks with high magnesium and low silica content also produces magnesium-rich olivine, or forsterite. Iron-rich olivine is relatively much less common, but it occurs in igneous rocks in small amounts in rare granites and rhyolites, and extremely iron-rich olivine can exist stably with quartz and tridymite. By contrast, magnesium-rich olivine does not occur stably with silica minerals, as it would react with them to form orthopyroxene ((Mg,Fe)2Si2O6). 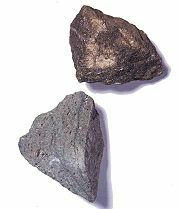 Magnesium-rich olivine has also been discovered in meteorites, on Mars, and on Earth's Moon. Such meteorites include chondrites (collections of debris from the early Solar System), and pallasites (mixes of iron-nickel and olivine). The spectral signature of olivine has been seen in the dust disks around young stars. The tails of comets (which formed from the dust disk around the young Sun) often have the spectral signature of olivine, and the presence of olivine has recently been verified in samples of a comet from the Stardust spacecraft. Olivines are widely distributed around the world. Some of the finest, gem-quality stones have been obtained from mantle rocks on Zagbargad island in the Red Sea. Olivines have also been found in Mogok, Myanmar; Kohistan, Pakistan; Ural Mountains, Russia; Chihuahua, Mexico; Minas Gerais, Brazil; Victoria, Australia; Eifel, Germany; France; Norway; Sweden; Ethiopia; and China. In the United States, they have been found in Hawaii, North Carolina, New Mexico, and Arizona. Members of the olivine series may be thought of as solid solutions of forsterite and fayalite, and their compositions are commonly expressed as molar percentages of these two endmembers. For instance, Fo70Fa30 represents a 70:30 molar ratio of forsterite to fayalite. Forsterite has an unusually high melting temperature: Almost 1900°C at atmospheric pressure. The melting temperature of fayalite is much lower, about 1200 °C. The melting temperature of other members of the series varies smoothly between the two endmembers, as do other properties. The green color of olivine is thought to be a result of the presence of iron and traces of nickel. It may alter to a reddish color from the oxidation of iron. The mineral has a conchoidal fracture and is rather brittle. Its hardness is 6.5–7 on the Mohs scale, and its relative density is 3.27–3.37. Figure 1: The atomic-scale structure of olivine, looking along the a axis. Oxygen is shown in red, silicon in pink, magnesium/iron in blue. A projection of the unit cell is shown by the black rectangle. Minerals in the olivine group crystallize in the orthorhombic system (space group Pbnm) with isolated silicate tetrahedra. From this view, olivine is classified as a nesosilicate. In an alternative view, the atomic structure can be described as a hexagonal, close-packed array of oxide ions, with half the octahedral sites occupied by magnesium or iron ions and one-eighth of the tetrahedral sites occupied by silicon ions. 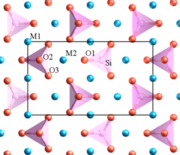 There are three distinct oxygen sites (marked O1, O2, and O3 in figure 1), two distinct metal sites (M1 and M2), and only one distinct silicon site. O1, O2, M2, and Si all lie on mirror planes, while M1 exists on an inversion center. O3 lies in a general position. At the high temperatures and pressures found deep within the Earth, the structure of olivine is no longer stable. Below depths of about 410 kilometers (km), olivine undergoes a phase transition to the sorosilicate, wadsleyite, and, at about 520-km depth, wadsleyite transforms into ringwoodite, which has a spinel structure. These phase transitions lead to a discontinuous increase in the density of the Earth's mantle that can be gauged by seismic methods. The pressure at which these phase transitions occur depends on temperature and iron content (Deer et al., 1996). At 800°C, the pure magnesium endmember, forsterite, transforms to wadsleyite at a pressure of 11.8 gigapascals (GPa) (118 kbar), and to ringwoodite at pressures above 14 GPa (140 kbar). Increasing the iron content decreases the pressure of the phase transition and narrows the wadsleyite stability field. At about 0.8 mole fraction fayalite, olivine transforms directly to ringwoodite over the pressure range 10–11.5 GPa (100–115 kbar). Fayalite transforms to Fe2SiO4 spinel at pressures below 5 GPa (50 kbar). Increasing the temperature increases the pressure of these phase changes. 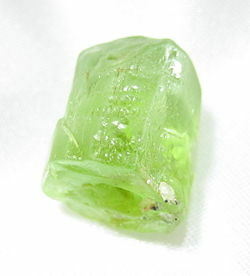 Besides the use of peridot as a gemstone, olivines are used in foundry sand, abrasives, and refractories. They are also used for heat storage, soil conditioning, and slag conditioning. According to Rebbenu Bachya, the word "tarshish" in Exodus 28, verse 20 means "chrysolite" and was the stone on the Ephod representing the tribe of Asher. ↑ NASA Press Release. 2006. NASA's Stardust Findings May Alter View of Comet Formation. NASA Jet Propulsion Laboratory, California Institute of Technology. Retrieved April 9, 2007. ↑ Mineral Gallery. 2006. The Mineral Olivine. Amethyst Galleries. Retrieved April 9, 2007. ↑ Deborah A. Kramer. 2001. Current Mining of Olivine and Serpentine. U.S. Geological Survey. Retrieved April 9, 2007. This page was last modified on 16 February 2015, at 17:42.